Google has announced an enhancement to its image search facility allowing users to upload a picture or paste a URL to a picture and search for similar images. 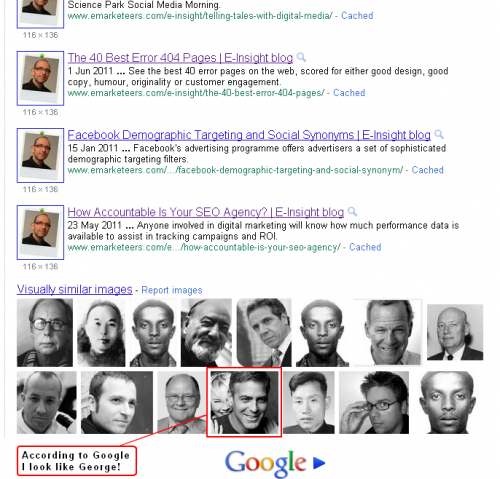 When you visit Google Images you will see a camera icon to the right of the search bar. You can either upload your image or paste the path to an image online and Google will find appropriate results in addition to similar images. This is a welcome addition to Similar Images announced by Googe back in 2009. Google has released this handy little video which explains it all. As an experiment I uploaded a picture of me. Whilst it adequately found other instances of my photo, it also listed similar photos at the bottom of the SERP. What really made my day is that according to Google I look like George Clooney. Woohoo! Google image search still not quite there yet. I tried to use it to id a flower growing in the yard and got many images of the out of doors, some containing people, some animals, some just plants but none of the same plant and relatively few with flowers of the same color even.